The Internet has taken over our lives to such an extent that these days we’re probably more likely to associate reading with skimming over web pages and blog articles than engaging with real-life books. In the fast-paced modern world it is easy to forget the benefits gained from reading a book, cover to cover. But hidden within the humble book is the power to inspire us, to challenge us, to connect with our potential. Books expand our imagination, transform our consciousness; they change our lives. Over the next few months we’re going to re-connect with our appreciation of books here at Windhorse Publications. Because books are also a great way of connecting with other people – perhaps the most wonderful thing about reading a great book is sharing our experience of it with others. So what is the book that changed your life? Whether it is a novel, an academic work or a spiritual text, we’ve all got one! ‘In the late 1970s, between finishing high school and going to university, I opened a small book of ancient verses, and my life changed forever. ‘I’d been interested in Buddhism for years, but my local library only had one book on the subject — a rather dated “Teach Yourself” guide to Zen Buddhism. I’d read the book, and found it both intriguing and baffling, but struggled to get a sense of what difference Buddhism would make to my life. And I was looking for something life-changing. ‘One early autumn day I accompanied my parents on a shopping trip to the nearest large town, which was the possessor of that rare and precious thing — a bookshop. I’d inherited a love of reading from my father, and so the two of us went (more or less) one way while my mother went hers. And after a period of browsing, I happened across a slender black-spined volume: the Dhammapada. I can still see exactly where in the bookshop, on which shelf, and where on the shelf the book sat, as clearly as I can see the book now on the desk in front of me. “What we are today comes from our thoughts of yesterday, and our present thoughts build our life of tomorrow: our life is the creation of our mind. If a man speaks or acts with an impure mind, suffering follows him as the wheel of the cart follows the beast that draws the cart. ‘These clear and simple words were revelatory. We have choices. The key to happiness and suffering lies in the quality of our thoughts, words and actions. Reading these verses, I knew I was a Buddhist. *The Dhammapada, translated by Juan Mascaró. Bodhipaksa has written a blog post explaining why this translation of the verses, although inspirational, is not true to the original Pali. 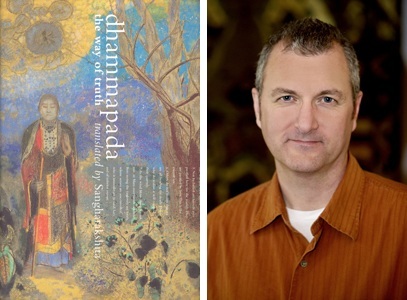 You can find out more about Sangharakshita’s translation of the Dhammapada on the Windhorse Publications website. Bodhipaksa is author of Wildmind: A Step-by-Step Guide to Meditation and Vegetarianism: A Buddhist View.